This month's recipe swap is a Jelly Cake - two layers of a spice cake with jelly between the layers. The goal of the swap is to modify the recipe by at least 3 ingredients or modify the method. I wanted to play pretty close to the original ingredients but really deviate from the the idea of a sweet cake. 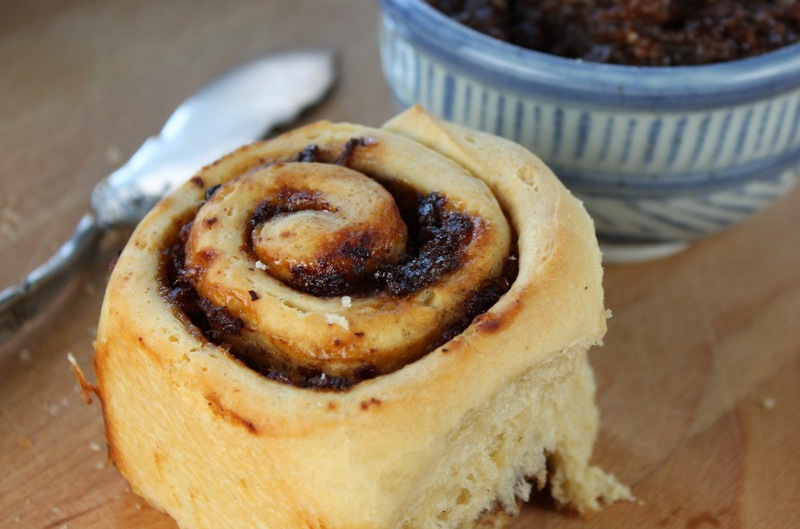 Two words: Bacon Jam. Or you can call it Bacon Jelly, which is also two words. Either way. My first step was to get away from the sweet, fruit jelly - that's where the bacon jam comes in. Next, my goal was to create a non-cake-like-layered item while using the base cake ingredients. Add in some yeast, remove the baking soda and cream of tartar, move the spice ingredients to the bacon jelly and WAMO - a rolled homemade bacon jam bun. Successful? Hell yes! It's a Fat and Happy homemade bacon bread recipe that I highly suggest trying today. 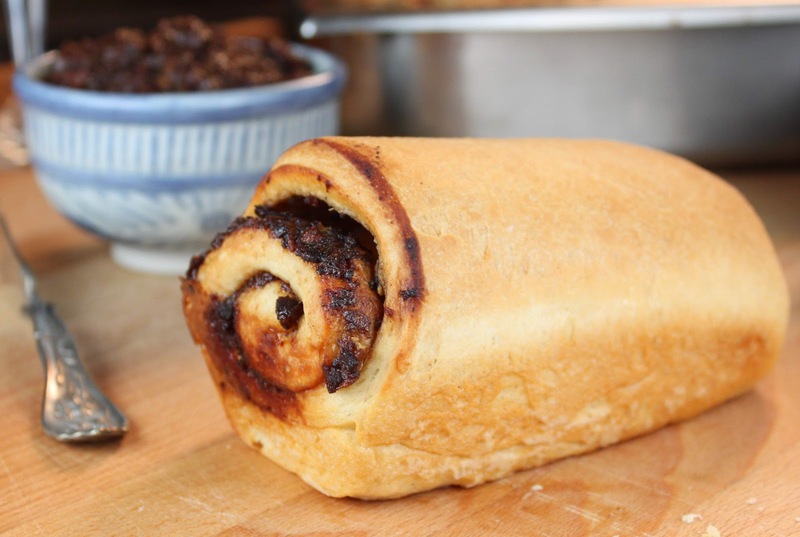 Tips and techniques: If you don't have time to make the homemade bread, try rolling the bacon jam in phyllo dough or store bought bread dough. The jam itself is deep, rich, delicious - simply not to be missed. Heat the water, cream and sugar to 115 degrees, sprinkle yeast over the warm liquid and allow to sit and foam for 10 minutes. With a fork, mix the egg, molasses, salt, melted butter together - add to the foaming yeast. Use a wooden spoon, begin to stir in the flour, 1/2 a cup at a time. Once the dough comes together, pour onto the cupboard and begin to knead in the remaining flour. Depending on the weather, you may or may not need all 4 cups, go by the feel of the dough and just use your best judgement. Knead the dough for about 10 minutes. Place the dough in an oiled bowl, rub oil on the dough itself, cover with a dry kitchen towel and set in a warm place to rise until doubled in size (this should take about an hour or so.) Punch down the dough, knead a few times and then roll out into a large rectangle about 3/4" thick. Spread the bacon jam over the dough rectangle (I saved a small bowl to eat.) Roll up the dough from the long side of the rectangle and pinch the seam together to seal. Slice the rolled dough into 2" sections and place in a greased cake pan. Or slice the rectangle into 2 or 3 sections and place into bread pans for a bread roll instead of individual buns. Cook the bacon until done but not too crispy. Remove the bacon from the pan and set aside, drain all but 1 tablespoon of the fat. Add the onions and cook uncovered over medium low heat 10 minutes, stir often. Add the brown sugar, allspice, cocoa, raisins and cayenne pepper; cook on low for 10 minutes covered. Add in the garlic and cook another 5 minutes covered. Add in the remaining ingredients, the apple juice, red wine and the balsamic vinegar, cook for 30 minutes covered on medium low. Remove from heat and cool slightly. Place the bacon jam in a cuisinart and pulse on low about 20 seconds. If you want a smoother jam, pulse longer. Cool before rolling in the dough. Christianna - Creator of the Recipe Swap with amazing blog at Burwell General Store. Lindsay was the first blogger I asked to do the swap. I found her blog after a day of surfing around looking for new recipes, and became hooked by the honesty and simplicity written into her recipes. She loves Oregon, its ingredients and Portland's lifestyle, and it shows. Chef Dennis joined us on the Lemon Cake swap. A veteran chef in his own right, we are lucky to have his Italian Lemon Pear Cake contribution to the swap. The rest of his fantastic food blog can be seen at morethanamountfull. Boulder Locavore’s starting point for the recipe swap is always a local-seasonal-organic combination, though her love of international cuisine and cocktails often work their way into the mix! Joy, holding down a dairy-intolerant household, doesn't let that restrict her love of flavors and food, in fact, I think it inspires her to do what she does. When you visit her blog, be sure to check out her "ubiquitous about page" and the balcony gardening category. Monique has been food blogging since 2007, her Fat and Happy blog is about food, recipes, cooking, baking, drinking, eating and friends! As the former owner of the Monkey Bean Cafe and Bistro, she still loves to create recipes from scratch. If you send her an unusual ingredient, she'll create a recipe for you! Priya is also joining us from Australia. She's a vegan who loves baking, cooking and eating, having chosen the lifestyle after being a vegetarian most of her life. She caters hand-crafted vegan and vegetarian food, and also delivers hand-crafted vegan and vegetarian cookies and cupcakes. Pola is a new blogger from Italy, transplanted to the cold Midwestern plains. After years of calling mom to check on cooking times and temperatures of family Italian recipes, she started writing them down. In the process, she is hoping to help new friends discover how to cook simple and authentic Italian food. Mary is a lifelong resident of the San Francisco Peninsula and was diagnosed with Celiac Disease in 2007. Her search for a gluten-free chocolate chip cookie that didn't taste, look or feel gluten-free inspired her blog and she's been happily baking ever since. Jamie blogs at Random Acts of Food and has a love for food that only an Italian could! She enjoys cooking and baking in all cuisines for her family and friends. Originally from Long Island, Jamie now resides in Boston with her amazing boyfriend. Crissy and Lauren are two So Cal natives and recent college graduates who are embracing their passion for all things culinary in their Little Yellow Kitchen. They blog at From The Little Yellow Kitchen about maintaining a balanced diet of equal parts healthy, savory, and sweet. From a zesty Chocolate Mojito Key Lime Pie to a nutritional Rosemary Parmesan Kale Chip snack, this kitchen has it all. Claire blogs with Texas pride from Dallas. She loves chicken fingers, Law and Order SVU and is left handed. We are excited to have her! Sabrina Modelle is the girl behind The Tomato Tart, a blog about the unadulterated love of food and cooking. Farmers markets, ethnic groceries, high-end restaurants and tiny taquerias all provide inspiration for the Northern California native who was raised in a French family with food at the center of life. From rich chocolate cakes to vegan curries, the Tomato Tart is full of flavor both figuratively and literally and like food, best enjoyed with a nice glass of wine. Nicolle writes the joyful Rhythm of the Seasons from Boulder, Colorado and is looking forward to offering more recipes and menus as the spring, summer and harvest seasons heat up. Jacqueline aka The Dusty Baker, believes food restrictions are no reason to avoid fun in the kitchen! She updates classic pastries into gluten, dairy, sugar and vegan optional recipes, blogging both her successes and messy failures. A performer and writer with quite a gypsy-like lifestyle, she can often be found trolling the NYC subways with her standing mixer in a rolling suitcase or driving between jobs with a trunk-load of frosted cookies. writes the fun into allergy-friendly recipes and spunky stories from New York City, and can be found at The Dusty Baker. Linda is an award-winning journalist, food writer and nutritionist and Founder/Editor/Publisher of EENews, for sustainable food and sustainable life. She has written 20 cookbooks that have garnered prizes including the James Beard for one she wrote with her daughter, Katherine West DeFoyd, entitled Entertaining 101, Doubleday. Their follow-up book, Stylish One Dish Dinners, Doubleday, was also nominated for a James Beard prize. Her ground-breaking book, Bread in Half The Time, Broadway Books, was named the Best Cookbook in America by the prestigious IACP, The Julia Child Award. Tricia is the founder of Pietopia, an annual pie contest that asks "What does your life taste like, in a pie?" and her beautiful work as an eating designer and blogger can be found at Eating Is Art. Alli has a master's degree in Nutrition and blogs at An Open Cookbook from Seattle, Washington. We met recently at BlogHer Food in Atlanta, and immediately hit it off. A warm welcome to her! BACON JAM?!?!?!!? YOU ARE MY NEW BEST FRIEND!!! I am definitely going to be making this very soon - so thank you for making many people in my life extremely happy with this recipe. And what an incredibly savory take on the swap! That is a creative redo of the jelly cake! I love it! i love this re-interpretation of the jelly cake! 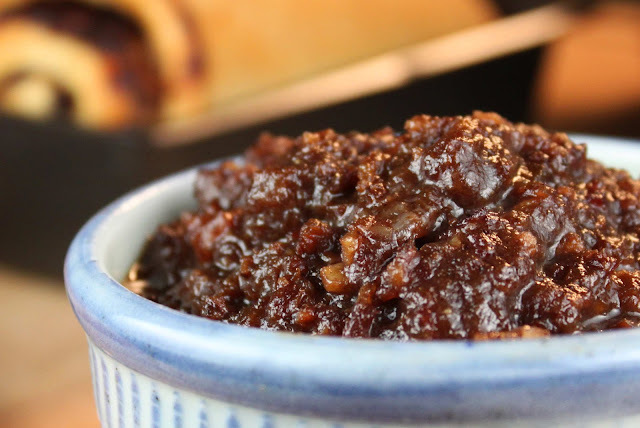 i am obsessed with bacon jam. i made some for my blog about a month ago, and it continues to be the most popular post in my site's history! clearly, the rest of the world is as obsessed with bacon as i am, which is a good sign! i so need to make these right now! WIN WIN WIN - we need to start giving recipe swap awards for awesomeness! Thank you, as always, for your participation in the recipe swap. I love your recipes and dedication to exploration in the kitchen. O-M-G what a most brilliant idea with the bacon jam. My stomach is literally growling at 11pm after just eating dinner! What a fantastic idea! I've heard about bacon jam but have not tasted any....yet! I love this twist you've come up with. Very clever! Love, love, LOVE your spin on this swap! Also, I happen to be starving right now and these are making me drool! Now this is a roll that I could really invite in my house any time of day! What an incredibly delicious and creative take on Jelly Cake recipe! I just joined the recipe swap and was reading through blogs..this post is so unique and yummy! Bacon makes everything better! Wow, this looks so super yummy. I have to try these. Savory jams are my fave. So creative. Love it. Be still my heart.....bacon jam, can it be so!!! If Christianna hadn't given you an award, I would have had to! great job with your take on the recipe!! Oh...wow.... I realize that I'm a little late to the bacon party, but I'm going to go ahead and say better late than never. This looks amazing! I'm a fan of sweet/savory combos, and this is going on my "make immediately" list.